More cruise lines are heading to Honduras this year which is also helping a sharp increase in the number of cruise passengers. Honduras is experiencing a sharp increase in passenger numbers thanks to some of the largest cruise lines in the world and more new operators being added. The Central American country is fast becoming a leading port of call for Caribbean itineraries and compared to 2016 it is rising even further. New vessels calling at Honduran ports this season included Azamara Cruises’ Azamara Quest, with a visitor capacity of 690 people, Swan Hellenic Cruises’ Minerva welcoming 350 tourists per ship, and Tui Cruises’ Mein Schiff 4, with a total capacity of more than 2500 passengers. At the moment in addition to the three cruise lines we mentioned above 18 are sailing to Honduras including Carnival Cruises, Norwegian Cruise Line, Royal Caribbean International, Princess Cruises, Costa Cruises, Holland American Line, Thomson Cruises, Oceania Cruises, Tui Cruises, MSC Cruises, Regent Seven Seas Cruises, P&O Cruises, Silver Sea, Noble Caledonia, Swan Hellenic Cruises, Azamara Cruises, Hapag-Lloyd Cruises and Sea Cloud Cruises. Over a million cruise passengers visited Honduras in 2016 and 3 percent more are expected in 2017. Most of the passengers will come from cruise ships calling in the island of Isla Roatan. 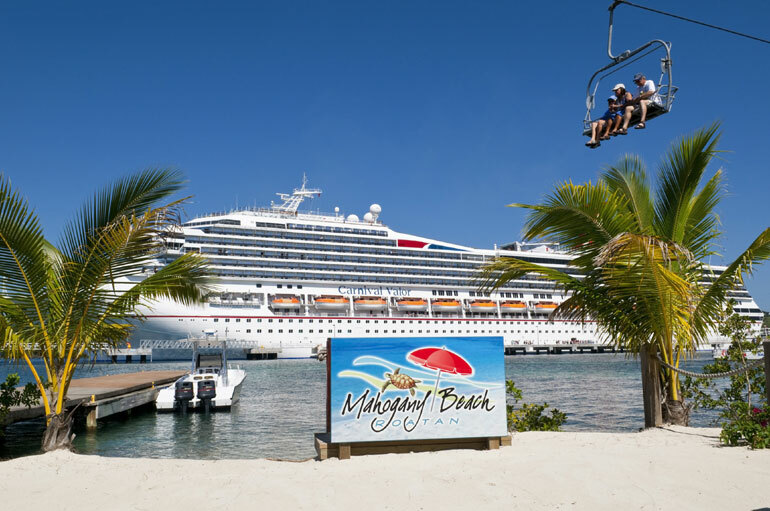 The island features two main ports – The Port of Roatán which can accommodate one ship at a time and has three spaces in the Anchorage area as well as Port Mahogany Bay which can serve up to two ships at a time. The 3,080-passenger Crown Princess, one of Princess Cruises’ largest ships. Carnival Cruise Line’s Carnival Breeze, Conquest, Dream, Fantasy, Freedom, Glory, Magic, Miracle, Paradise, Sunshine, Splendor, and Vista. Norwegian Cruise Line’s Breakaway, Dawn, Epic, Escape, Gem, Getaway, Jade, and Pearl. Royal Caribbean Cruises‘ Liberty of the Seas from Galveston, Vision of the Seas from the Port of New Orleans, Rhapsody of the Seas and Brilliance of the Seas from Tampa, Serenade of the Seas from Port Everglades and Allure of the Seas from Miami and others, for a total of 18 itineraries. Regent Seven Sea Cruises‘ Seven Seas Mariner, Seven Seas Explorer, and Seven Seas Voyager and Costa Cruises‘ Costa Deliziosa departing from Port Everglades. A brand new cruise port is also coming to Honduras on the Pacific Coast. The new port will be called the Amapala cruise port on Isla del Tigre (Tiger Island), just off its Pacific Coast. The new destination is set to open up in 2018 and will easily allow cruise ships to dock. We’ll be posting more about this new port as more details are released in the future. 320 cruise ships called at Honduras in 2015 and 341 called in 2016. Here’s to even more vessels sailing to the destination and making even more epic cruise vacations.